Do you wish to achieve great results in GAMSAT? Practice and more practice with thorough understanding is the only choice you have for preparing comprehensively for the exam. But, preparing for the GAMSAT exam all by yourself can be difficult. It can make you confused and tensed. Master Coach has years of experience in preparing the students for GAMSAT and analyzing question types in the science section. 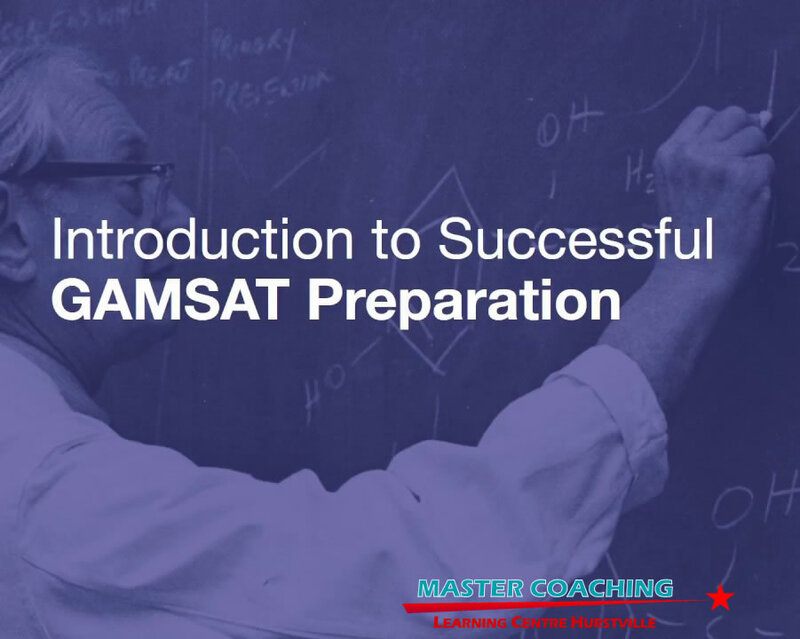 Our tutors have developed a great sense of what is crucial for successful GAMSAT preparation and a set of time-saving strategies for tackling GAMSAT questions. At Master Coach, our knowledgeable, qualified, and easy-going tutors work through the core subject concepts and skills of English and Science with you according to your pace in order to help you build your confidence and ability on the right time for your GAMSAT exam. We are discussing GAMSAT and anyone who wishes to appear for GAMSAT exams surely must be aware of what is it. For the ones who are confused, GAMSAT is an abbreviation for Graduate Medical School Admission Test. Now, you must have understood clearly that GAMSAT is a medical entrance test that a student needs to appear for getting admission in the medical colleges. GAMSAT is designed to evaluate a wide range of understanding in the students who apply for health and medical professional graduate programs in Australia. Without appearing for GAMSAT, you cannot be eligible for admission in such courses. With the 3 sections in the GAMSAT, namely, written communication, reasoning in humanities and social sciences, and reasoning in biological and physical sciences, you must be thoroughly aware of the topics and prepare it well to succeed in GAMSAT exams. Each of the sections is carefully designed to gauge the various areas of understanding and intelligence, varying from written communication to physical and biological science. The first two sections that are written communication and reasoning in humanities are closely related as you will often be required to voice your judgment and opinions on the texts read in Section 1 and write about the same in Section 2. For the third section, you must have the basic knowledge of scientific principles and it is completely different from the first 2 sections. You can appear for GAMSAT in the months of March and September. The purpose of the GAMSAT exam is to measure a student’s aptitude to evaluate and comprehend the materials drawn from a variety of sources. In addition to analyzing your logical thinking and communication skills, the GAMSAT exam also weighs your ability to solve problems across a range of subjects, usually related to sections 2 and 3 of the GAMSAT exams. Are you thinking how to go about GAMSAT exam preparation? Preparation for GAMSAT does not involve any core curriculum or lesson structure. It is the basic scientific reasoning knowledge that is taught in the 1st year of tertiary studies. It is basically diving into the old textbooks taught in the last year of your secondary school. The GAMSAT exam questions may vary in each section. You will have to understand a graphical display or a passage of writing, use your sensible hands-on knowledge and knowledgeable skills to solve the problems and answer MCQ-type (multiple choice) questions using reasoning and logic. In order to be completely prepared for the GAMSAT exam, an expert support and guidance along with the GAMSAT practice papers can be highly beneficial for your success. Master Coach is one of the best coaching institutes in Sydney that has a record of successful GAMSAT candidates in the previous years. At Master Coach, we help you to prepare for the GAMSAT exam that includes GAMSAT workshops and expert guidance by the private tutors. Why Should You Consider Master Coach? Master Coach tutors are friendly and easy-going which makes the students comfortable in the class or at any point of difficulty. Our experienced tutors always go an extra mile for ensuring the comfort of the students and care for them with a personalised approach that any student would search for. All our GAMSAT tutors work in small groups of no more than 5 students to pay equal and complete attention to the students. This helps both the students and the tutor to focus on the aspects of preparing for the GAMSAT exam. The students need not shy away from questioning as our GAMSAT tutors are cooperative and helpful. At Master Coach, our methodology helps the students to enhance their confidence and skills that are required to tackle the GAMSAT, in addition to being supported by the continuous supervision and guidance from a personal coach. Our GAMSAT tutors at Master Coach are highly qualified and expert tutors who have been preparing the students for GAMSAT exam in Chemistry, Biology, English, and Essay structure skills for over 17 years. Over the last 17 years, our GAMSAT tutors have worked diligently with numerous students and have helped them attain their ambitions of getting into Dentistry or Medicine. As per the previous year records, we have a track record of over 86% success of the students in getting into Medicine on their 1st attempt, ascertaining that hard work, motivation, and a little support of the experts go a long way to achieve your objectives. For achieving a great GAMSAT score, join Master Coach and sharpen your skills. At Master Coach, you will not just prepare your lessons but also build your confidence to face the GAMSAT exam. Contact us today and let Master Coach’s specialised GAMSAT exam preparation programs take you through the step by step process for the challenging journey ahead.